A unique botanical and amino acid formula for support of intestinal health. 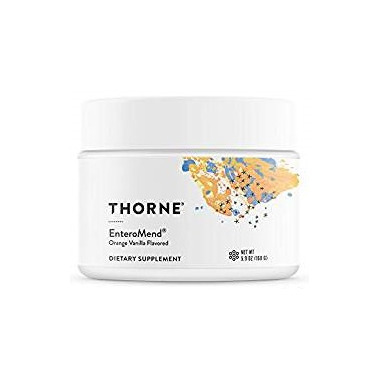 EnteroMend combines the mucosa-protective effects of L-glutamine with highly-absorbable botanical complexes to provide a unique and great-tasting orange-vanilla powder for maintenance of a healthy intestinal tract. Flavors, Citric Acid, Stevia extract (leaf) (Rebaudioside A 95%). Mix 1 level scoop one to two times daily with 5-6 oz. of water or as recommended by your health-care practitioner. This product is contraindicated in an individual with a history of hypersensitivity to any of its ingredients. EnteroMend contains curcumin and boswellia phytosomes, plant extracts complexed with phosphatidylcholine, which is derived from soy. Phosphatidylcholine contains no soy protein. There are no other soy-based ingredients in EnteroMend. If pregnant, nursing, or trying to conceive, consult your health-care practitioner before using this product. Curcumin has been shown to reduce the therapeutic efficacy of cyclophosphamide (Cytoxan) in animal studies. In vitro research revealed that curcumin decreased camptothecin-induced death of cultured breast cancer cells. Curcumin might also interfere with the absorption and efficacy of the chemotherapy drug irinotecan, used to treat colon cancer. The concurrent use of curcumin with these agents should be avoided.